Sri Adi Shankaracharya is considered an incarnation of Shiva and the world’s greatest Guru (Jagathguru). He purified Vedic knowledge by teaching discernment and he instituted the worship of deities as worshipping different forms of the one God. About 2500 years ago when the people were not living in accord with their inherent spirituality, all the gods and rishis went to Kailash and pleaded with Lord Shiva to revive the world. Lord Shiva agreed to their request and informed them that he would be born into this world. 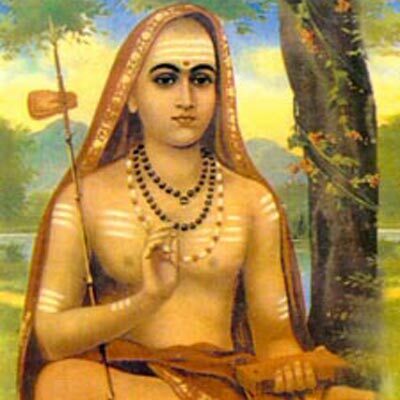 Adi Shankaracharya was born to the Nambudri Brahmin couple, Shivaguru and Aryamba, in a little village, called Kaladi, in Kerala. The couple had remained childless for a long time and prayed for children. Shiva is said to have appeared to the couple in a dream and promised them a choice of one son who would be short-lived, but the most brilliant philosopher of his day, or many sons who would be mediocre at best. The couple opted for a brilliant, but short-lived son, and thereby Shankara was born. Shankara traveled and searched for a worthy Guru who would initiate him and take his vow of sanyasam (monk). He found the Ashram of Govinda Bhagavathpada who he recalled was Patanjali in a previous birth. Govinda was also the disciple of Goudapada (one of the early and most reputed philosophers of the Vedanta school of thought). Shankara was accepted as a disciple by Govinda, who initiated him into the highest kind of renunciation. He taught various Vedas to Shankara as well as advaita, the principle that everyone in this world is the manifestation of God and that God and Atma are one and the same. He advised Sri Shankara to go out into the world and spread this truth throughout the country, which he did. At Badrinath, Lord Vishnu appeared before Shankara and told him that his sculpture in the Alakananda River should be taken out and a temple should be built for it. 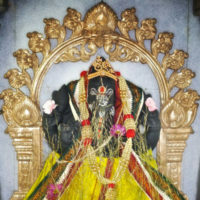 This temple is called Badrinarayan Temple and is one of the important religious places for devotees. When he was 12 years old, Shankara wrote his most profound commentary on the Vedanta Sutras of Vyasa. He wrote commentaries on the Gita, Upanishads and Brahma Sutras, which are the authorities on the Vedanta Shastras. The commentaries of Shankara are monumental works covering the meaning of Vedic teachings with clear reasoning and understandable language. The system of Vedanta is what is known as Advaita or Non-dualism. Shankara’s commentaries were put to severe test not only by the teachers of various schools of thought, but also by the sage Vyasa himself. Vyasa encouraged Shankara to continue to debate and defeat hostile schools of thought and granted him a boon that significantly extended his life. 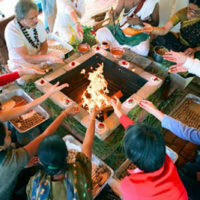 Shankara continued to teach and purify the knowledge. His principal disciples were Sureshwara, Padmapada, Hastamalaka, and Ananda Giri (Totaka), all of whom produced famous written spiritual works. He established places of spiritual wisdom for seekers of Truth in the four directions, each place bountiful with natural splendor and serenity. Shankara assigned each of his primary disciples to each center. He assigned Sureshwara to Sringeri in the South, Padmapada to Dwaraka in the West, Hastamalaka to Puri in the East, and Totaka to Badrinath in the North. Sri Shankara assigned a Veda for each center, making sure each would sustain and propagate that particular Veda. Puri had Rig Veda, Sringeri had Yajur Veda, Dwaraka had Sama Veda, and Badrinath had Atharvana Veda. Each of these centers functions to this day. Sri Shankara ascended the South Throne of Omniscience in Sarvagnya Peetham at Kashmir (a temple with gates in the four directions) after winning numerous debates and challenges, signifying the triumph of the doctrine of Advaita Vedanta. In addition to his other accomplishments, he composed hymns on Shiva, Vishnu, Ganesha, Subrahmanya, Sharada, Saraswathi, Lakshmi, Narasimha, etc. His compositions and writings on all the deities contain poetic excellence that thrill the common man, touch the emotions and carry the student forward in his evolution step by step. Sri Shankara is considered the highest intellectual the world has ever known. He remained a teacher until he was 32 years old. We celebrate Adi Shankaracharya’s birthday to pay our salutations, gratitude, and respect to him and the purity of the Knowledge.